Week 1 can be hard on fantasy football owners. Lots of expectations based on draft positions and nothing but unknowns on both sides of the football. These are 5 of the best running backs in the NFL that have a tough matchup to kickoff the NFL season. Last season, LeSean McCoy and Shane Vereen were the only RBs to rush for 100 yards on opening night. Vereen failed to score. Adrian Peterson and Joique Bell scored twice (Peterson also added a receiving TD), but only 12 other RBs scored, including Jackie Battle and Daniel Thomas. DeMarco Murray and Ray Rice each caught 8 passes, Vereen added 7, Arian Foster and Darren Sproles hauled in 6 receptions, while Joique Bell, Steven Jackson, Da'Rel Scott and C.J. Spiller totaled 5 pass catches. Reggie Bush was the lone RB to eclipse 100 receiving yards. Bush, Peterson, Vonta Leach and Ryan Mathews added receiving TDs. Do not read this and think for one second that I am suggesting that you bench these guys. Just a topic for discussion! 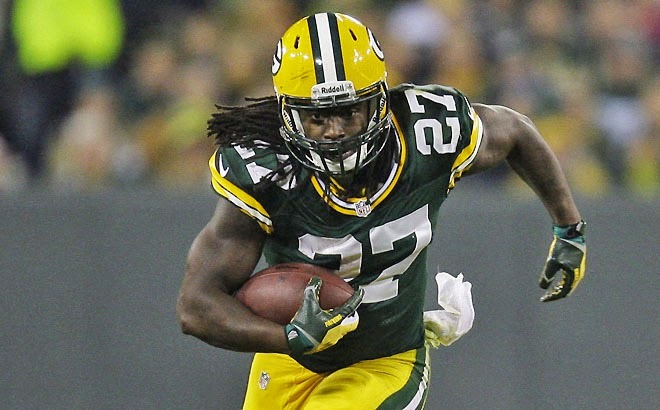 Richard Sherman's LOB is known more for shutting down QBs, but Lacy will have to have his best game to start the season against a team that allowed 4 rushing TDs in 2013. Aaron Rodgers (26/39 for 223 0 TD), Jordy Nelson (2 catches for 19 yards), and Randall Cobb (1 for -1) struggled two seasons ago at Seattle in the famous replacement ref hail mary game. The Legion of Boom has only grown stronger since then! San Fran was the only defense to not allow a single 100 yard rusher in 2013. Even with out Aldon Smith and NaVorro Bowman, the 49ers will be hard to run on. Ray McDonald, Quinton Dial and Justin Smith will beat the Cowboys O-Line all game long, leaving Patrick Willis and Ahmad Brooks with some nice lanes to attack Murray. Tony Romo, Dez Bryant, Jason Witten and Terrence Williams are going to have to open up the running lanes for Murray. The Ravens were the only defense in 2013 to see at least 430 rushing attempts (440) and allow less than 10 TDs (7). Andy Dalton will lead the Bengals onto the field operating in a new offensive scheme, and it will be interesting to see how Bernard and A.J. Green are affected by it. The Panthers tied the Seahawks for a league best 4 rushing TDs allowed. Doug Martin hasn't played since October 13 and will be playing in a new offensive system with a new QB in Josh McCown. It's a tough way to get readjusted to the NFL. The addition of Logan Mankins should help but he too will be adjusting to a brand new system after 9 seasons with Tom Brady and the New England Patriots. The Giants offense couldn't run the ball in 2013, and a road game against Ndamukong Suh is a terrible way to try start in 2014. Add to the fact that Eli Manning is just 19 of 37 for 188 yards and a single TD and the G-Men look like they are off to a slow start to the 2014 NFL season. Jennings might lead the NFL in preseason rushing yards, but he has played an extra game and 73 yards came on a single run. P.S. - Don't freak out after one week of football!